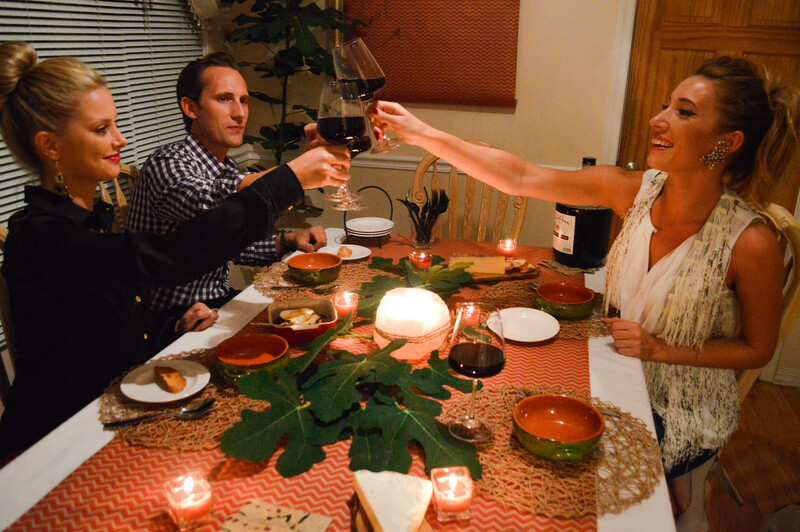 The idea behind creating an amazing night of food, fun, and decor is all based off of inspiration! Whether its perfect plums at the market, the most gorgeous baked bread, or even a lamp you spotted while thrift shopping… you can find inspiration everywhere and use it to sky rocket your creativity and imagination… The idea, to give your guests a tour through that mind of yours and feel inspired, cared for, loved, and left forgetting woes and stresses of the week, but remembering the thought you put into your evening and theirs. Being a part of #projectfab, Marshalls featured blogger program, I was gifted with some goodies! However, there were two items that really POPPED! A simple jar of sun dried tomato pesto for $6.99 and a cute clay baking dish for $5.99. After a quick stare, I felt a surge of inspiration transport me to a rustic night outside a villa in Italy. I’ve never been to Italy, but why not use your creativity to create a dream and make it feel as if you’re there. So that’s exactly what I did! TOTAL: Still under $100! Around $97! 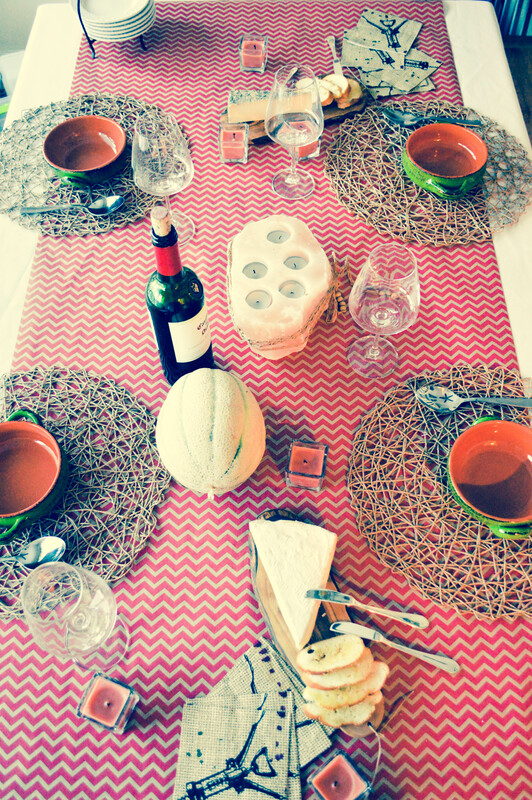 Browsing the clearance rack at Marshalls is where I spotted the zig zag wrapping paper, and I thought that would be the perfect runner for the table. Playing off of the browns and reds is where everything else started to fall into place. 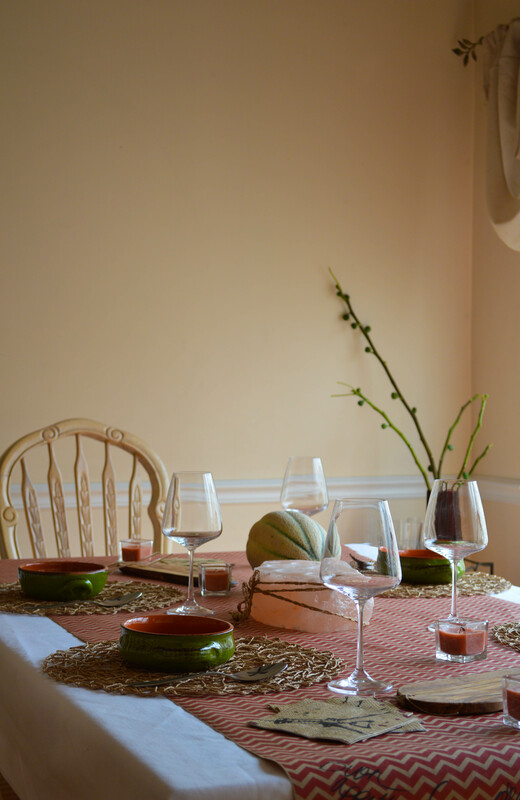 The Italian made olive green soup bowls, the organic feel of the natural woven placemats… it all just popped off the shelves as I stayed true to my inspiration… and I couldn’t be happier for how it turned out! Would you believe I also went outside and snapped a few branches off of our fig tree in the back yard lol! HEY THAT’S NATURE BABY AND WE’RE BRINGING IT IN HOUSE!! Anything goes when you feel inspired and just have fun! For the menu: I figured a gorgeous baked brie would be perfect. 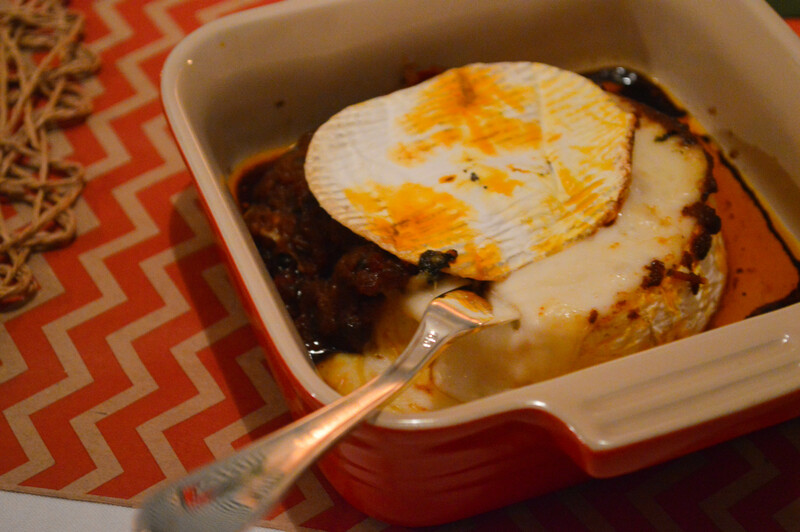 Cheese and wine, a no brainer… So I got a round block of goat milk brie (that I knew would fit perfectly in the red baking dish they gifted me with), sliced off the top and poured the sun dried tomato pesto over it and baked it. I also made some fresh crostinis with left over bread and a brush of olive oil. Buying a few more cheeses for my wood cutting boards, I selected another brie, this one cows milk, and also a block of parmesan for something a little firmer. But my favorite… I think if you look below you can tell 🙂 It was drippy, creamy, delicious, and totally P4P! Obviously, the soup bowls inspired a soup… and how we do it in my house is: what’s in the fridge? We had spinach, sun-dried tomatoes, potatoes, orzo pasta, and voila! 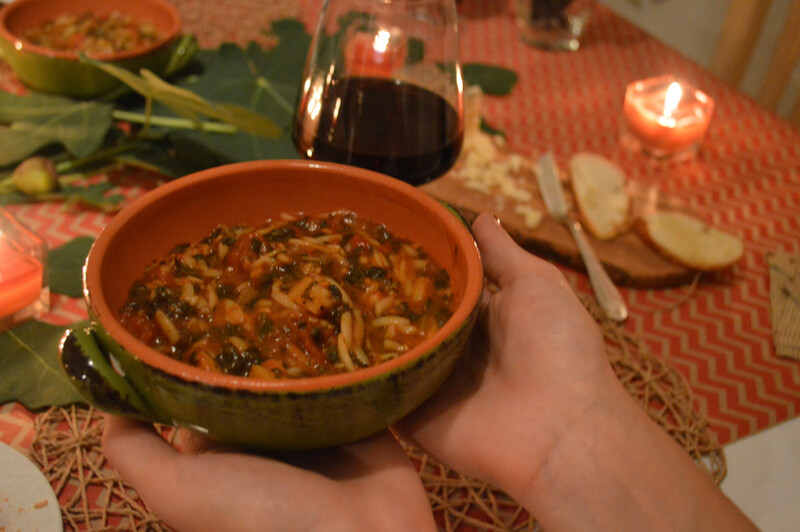 Sun-dried tomato and Spinach Orzo soup topped with grated peccorino romano! 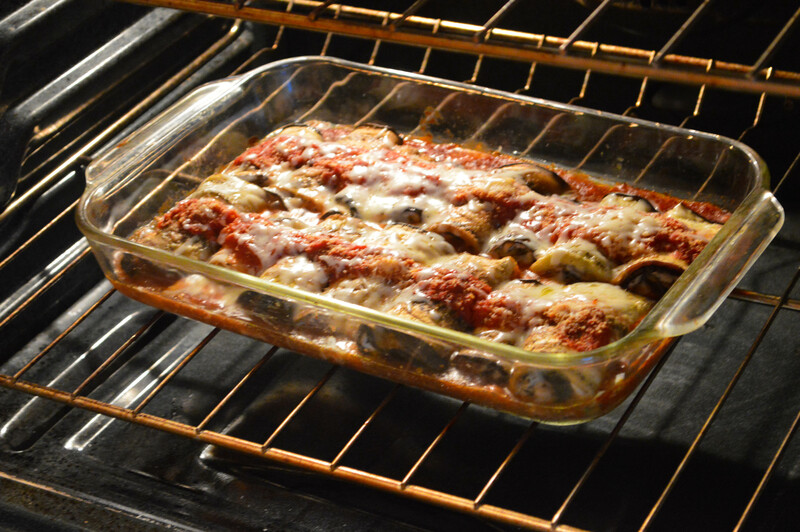 For the small app plates, a very inexpensive dish that’s super delicious… I decided on eggplant rolitini! It’s cute, tiny, not heavy, and is ridiculously easy. Slivers of eggplant, boiled ever so slightly to get them pliable, were rolled with ricotta cheese, parmesan, salt, pepper, and topped with crushed tomato, mozzarella, a drizzle of olive oil and more parmesan. Baked until bubbly… Molto Buono!